Datamax-O'Neil I-4208 - Thermal transfer printing, 203 dpi, 4" print width, Serial and Parallel Interfaces, Peel-and-present, Rewinder, and Cutter. Includes US power cord. Order cables separately. 4" x 6" Direct thermal paper label. 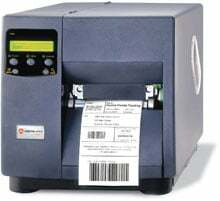 1000 labels/roll, 4 roll case. Also available as a roll (Part# 301970-R). The Datamax-O'Neil R42-00-18940007 is also known as R42-00-18940007	or R420018940007	.